Now that I have taken a moment of your time to make that perfectly clear—I just want to say how grateful I am to those of you who wrote to the Mayor reminding him that he might have been a tiny bit silly in scheduling the Town Hall Meeting on the same day as the Garage Sale. But don’t they call it “Silly Season” when politicians start coming around. Apparently there is a really good reason for that!!! End of Political Subject!!! Seriously, I could not change the date. There are too many out-of-town buyers that start calling in September to find out when the Garage Sale is so they can book their flights & hotel rooms. You, the sellers, make this the great event that it is—I just do the paperwork. The next year’s date will appear on this year’s program and on http://www.balboa-island.com by the end of May. Spring is here and the Garage Sale, The Balboa Island Art Walk, Memorial Day and the Balboa Island Parade. I love May and June even they are some of the most hectic months on Balboa Island. We all have lots of fun and there really is something for everyone. Maybe you don’t like to clean out your house for the garage sale. Maybe you just like to walk around and visit with your neighbors and see what great bargains there are this year. Or you love to stroll the boardwalk during the Art Walk. And buy something created by one of your artist neighbors. We have a lot of talented people on the Island. I find a new treasure every year!! Can you decorate your golf cart for the parade? We really need more golf carts in the parade. Riding in a parade in a golf cart and waving at your friends is something you can’t do in too many places. There a lot of golf carts on the island—let’s decorate them all and make some memories!! Or decorate a bike for your children or grandchildren—and walk with them in the parade. Watch them laugh and smile. The parade is really a time of love and relaxation. A family time. A neighborhood time. Before the summer and the rest of the world comes to Balboa Island. I love Balboa Island—this is the place I have lived longer than any other place in my 62 years. I love the people—I love the businesses—I love the animals that walk the boardwalk with their owners every morning and evening. I hope I am here to enjoy the Island and all its fun for a long long time!! PS Don’t forget our new Promenade Dance Studio—Open House Tuesday April 22nd!!! (See Attached Flyer) We can now dance the night away on Balboa Island!!! Balboa Island Icons seem to have many common denominators—perseverance, unwavering courage, steadfast stability and integrity. Chuck Lehman is the personification of all these characteristics which help give the Island the values and spirit it retains today. Chuck was born in Oklahoma to hard-working German-English parents who relocated to San Diego. While his father made ends meet working the food business, Chuck had fun living across from famous Balboa Park where his mother managed apartments. While visiting predominately Italian-Portuguese school friend’s homes he was offered tasty bread from backyard ovens and ethnic food. His favorite activity was visiting his veterinarian grandfather’s nearby farm with all kinds of animals to enjoy. Chuck was drafted into the army in 1945 ending up in Korea just as World War II was winding down. He received special training in Field Artillery and was encouraged to make a career out of it. Chuck elected to return to San Diego and became a custom tile setter and then a District Manager for a wholesale grocery business. His sister introduced him to a Idell, a lovely creative lady who became his wife for 53 years. While living in West Covina their teenage daughter, Lowe, stayed on Balboa Island During Easter Week—then known as “Hell Week” - “the place to be” at Spring Break. The Lehmans fell in love with the Island and bought a home on Topaz and then on South Bayfront. After retiring Chuck and Idell bought a building on Marine Avenue and started “Idell’s Gift Box”, a place to find unique and quality gifts. It has remained a popular shopping place for Islanders/tourists and is devotedly managed by Chuck’s daughter-in-law, Candy Lehman. In a four year span Chuck lost his wife Idell, son, daughter and sister-in-law, while enduring ailments of his own. He remained undaunted—maintaining his homes, business and giving 4 grandchildren college educations with love and support from his family, friends and his cat “Gracie” who never leaves his side at home! “The Gift Box” @ 208 Marine Avenue will celebrate its 31st Anniversary with Open Houses—April 25, 26 and 27—1:00 to 5:00! Do stop by and see what the typical character of an Island Icon like Chuck Lehman built! The year was 1958—my grandparents bought a home on this magical island. I was two (Tommy) - Argyle was 4, Kimi was three. Little did we know what an impact the Island would have on our lives. In those days the beaches were filled with children and families. At 6:00 am we would be up putting towels and umbrellas on the beach. If you did not secure your spot there would be no room left. The three of us with all the other children—Dennis Vitarelli, David Pyle, Kelly McGillis, the Coopers, the Salters—fished dove and played on the beaches. We swam all day. What a great childhood. My grandfather had a 32 foot Chris Craft so weekends we went out fishing on the ocean. Then reality hit—we all had to get jobs and work. We had several jobs at the Jolly Roger and the Reuben E. Lee. Then Argy got a job with Johnny Brouton’s 76 Union Boat dock. The following summer he sold the dock to Bob Bisbee and Argyle helped manage the dock and he hired me. What a great job—pumping gas and talking. And listening to all the great “fish tales”. It was hard work but being on the water and meeting such wonderful people was worth it. After eighteen years in the this wonderland we had to grow up and get “real jobs” - full time! Argy went to work as an Assistant for Congressmen Robert Badham and was in Washington for seven years. Kim started a business of her own and I went to work in the film industry as a film editor. For twenty five years I was an editor in a room with thousands of feet of film. I enjoyed it at the time, but when I retired I could not wait to get back to the great outdoors—Balboa Island. DirecTv in Living and Sleeping Areas. Kitchenette. Spring is in the air and what a perfect time of year to drop in on my forever home front—Balboa Island! Lots of new and exciting merchandise going on up and down Marine Avenue. For starters, “Small Island Boutique goes Big City” . . i.e. Sydney Michelle—307 Marine . This trendy little shop is rockin’ hotter than ever with now a 2nd location in LA’s famous Beverly Center. Owner Courtney Ellis continues to carry the finest in women’s contemporary apparel including: Juicey Couture swim, daywear and lingerie, Catherine Malandrino separates, and other name labels. Island girls don’t want to miss a stop at the outdoor $50.00 Sale rack with some hot buys! Up the street I could not resist wandering into the old Balboa island Fire Station. This is now fashionably inhabited by the popular Fresh Produce—Handpicked line of 100% cotton ladies clothing. The comfortable collection of ‘mix and match’ pieces have been around for several years, usually featured in Nordstrom or other large retailers. It is really nice to know we can stop by anytime and find this colorful comfort-wear line! Spring has arrived—Summer will follow. Don’t let precious time slip away when it comes to making rental arrangements for visiting friends and relatives. Stop by one of our many Marine Avenue Real Estate offices and start the ball rolling early. Sometimes the hustle and bustle of tourists trolling the downtown area just gets to be too much—take a load off and head for Agate Avenue and the Park Avenue Café. I have found this little corner spot to be a wonderful retreat for quick sandwich, refreshing beverage or an early evening main course. When you can’t stand the heat—get over to their kitchen– the Park Avenue Café is located at 501 Park Avenue. A new kid on the block, Aloha Balboa—215 Marine Avenue. I spoke with owner Mary Barbaro and was delighted by her interesting background on Kaui before opening this eclectic little shop. She ran a bird refuge and garden as well as an antique vintage store. As you wander through the store you will see tropical remnants of her past everywhere. The highlight of the shop is her exclusive Dr. Peppers “Wild & Retro” sunglass collections—frames to unbelievable to describe!! Great gifts and all frames reasonably priced @ only $18.00 and Rx’s included as you prefer. Don’t forget to look over her lovely estate jewelry pieces as well as all the artwork. Ladies don’t you love it when you are carrying a fabulous handbag or other accessory and receive tons of compliments? Save a trip to those pricier competitors and head right over to Alex’s Fashions!! My good friend Rachel (co-owner) sold me the most gorgeous, crystal-encrusted bronze bag-ette in January and I am stopped constantly on the street for inquiries! The exclusive “MC Handbag Collection’ retails for no more than “65.00 ea. Coordinating wallets are available for a perfect match! “Not Your Daughter’s Jeans” available here too! Spring’s arrival suggests all things garden and outdoors—Island Home - 313 Marine Avenue—is the place for all your gardening decor. Just in: exquisite custom made seashell and gemstone encrusted door wreath. These gems are anything but ordinary—we are talking sizeable ‘chunks’ of amethyst, etc. Also lovely hand-painted rooster and hen figurines—perfect for your country kitchen or table. The ornamental bird houses and other treasures will delight you. BIYC signups are coming soon!! They will be Friday June 20, 2008 at 6:00 pm. At the Carroll Beek Center 115 Agate Avenue. The BIYC Commodore for this year is Tasha Bock . She can be reached at or 858.759.7799. There will be an opening ceremony on Saturday, June 21st and the races start on Monday June 23rd. Local Tip—Please don’t put comforters in the small washers at our local Laundromat. Today the fire engines showed up—3 of them—for an overheated washer motor. Our taxes are high enough—we don’t need to spend hundreds of dollars in gas and manpower on a load of laundry. Pay the extra few dollars and use the big washers that were intended for large items. 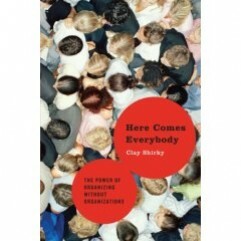 Great Book—Here Comes Everybody—Clay Shirkey—A great book on the power of the internet and how it has changed our lives. Easy to read and understand—I now know a whole lot more about the things that the younger generation takes for granted and how they evolved . . . . Wikipedia, Meetup, Power Curves, Flickr and more. Even Linux and what an open source code is—and I might even be able to explain it to you. Educating and amazing.